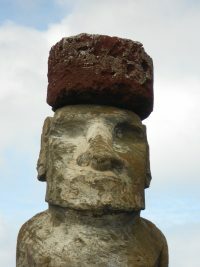 Researchers have long sought to pinpoint how the monumental heads (moai) of Easter Island (Rapa Nui) were put in place. The statues are up to 33 feet high and weigh up to 81 tons. They were carved from volcanic tuff quarried in one place on the east side of the island Rano Raraku and then moved to their final locations, an arduous task, to put it mildly. The latest studies suggest they were likely walked into place, rocked left and right along carefully prepared roads much like we’d move a refrigerator today. That still leaves the question of how hats (pukao) were put on some of the moai. The red scoria the pukao were made of was quarried from a different site on the west side of the island. While not as massive as the moai, the largest of the hats weigh 13 tons, so the logistics of transporting them to their final destinations on top of heads as much as 33 feet high were just as challenging. 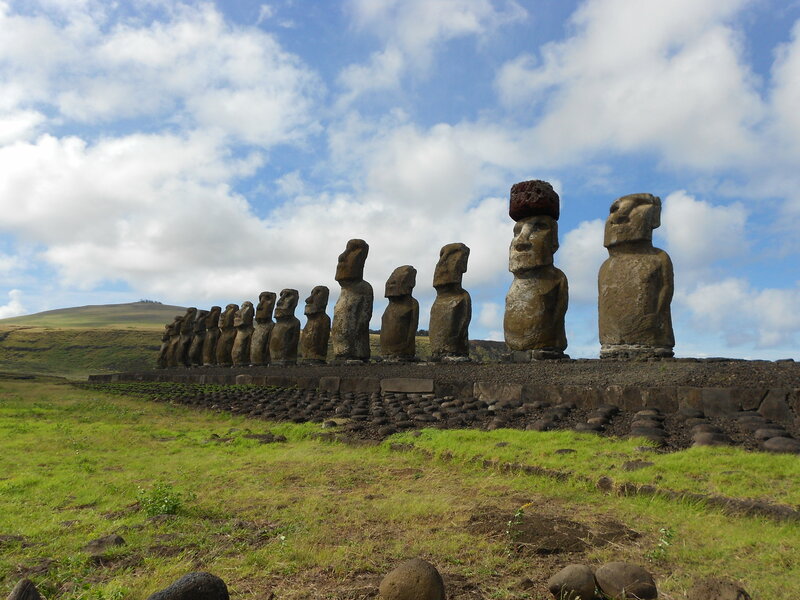 Previously researchers hypothesized that they were joined to the moai and then put in place together, but a new study focused on the archaeological evidence and 3D imaging to determine that the pukao were added after the statues were already in place. Red scoria chips have been found around statues wearing the hats, which strongly indicates they were carved into their final shapes only after they’d been moved. As those final shapes are variants of cylinders and cones, they were probably carved into cylinders at the quarry and then rolled to where the statues, already firmly in place, awaited their chapeaux. So far so goo, but how then to lift a dozen tons of hat onto 80 tons of head? The research team used photogrammetry (combining hundreds of high resolution photographs to create a detailed model) to identify any similarities common to all the hats on statues. They used 3D imaging to create models from the photographs that would allow them to analyze the pukao and moai in far greater detail than possible with the naked eye. They discovered only one feature common to all the hats: indentations at the base that fit the tops of the heads. Had the hats been slid into place, the edges of the indentations would have been ground down because the stone is so soft. Parbuckling is a simple and efficient technique for rolling objects and is often used to right ships that have capsized. The center of a long rope is fixed to the top of a ramp and the two trailing ends are wrapped around the cylinder to be moved. The rope ends are then brought to the top where workers pull on the ropes to move the cylinder up the ramp. Besides reducing the force needed to move the hats, this arrangement also makes it easier to stabilize the hat on the trip up because the hat typically will not roll back down the slope. The researchers report in the current issue of the Journal of Archaeological Science, that 15 or fewer workers could move the largest preform hats up the ramps. Once the hat was at the top of the ramp, it could not simply be pushed into place because of the ridges on the margin of the hat base indentation. Rather, the researchers believe that the hats were tipped up onto the statues. First the hat would be modified to its final form, some including a second, smaller cylindrical piece on top. The hats could be rotated 90 degrees and then levered up with small wooden levers to sit on the statue tops, or the ramp could be slightly to the side, so that rotation in the small space at the top of the ramp would be unnecessary. Then the hat would simply be levered and pivoted on edge and into place. The ramps were then disassembled and became the wings of the platform surrounding the statues. The results of the study have been published in the Journal of Archaeological Sciences.